This month’s featured product is a real winner! 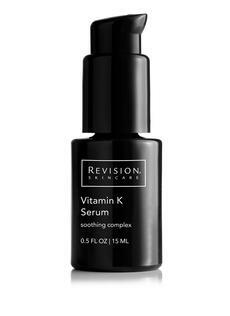 Not only does soothe and moisturize the skin, but it’s PACKED with beneficial antioxidants, including Phytondione, a very beneficial form of Vitamin K.
Without further ado, we bring you: Revision Skincare’s Vitamin K. Serum! Want to know more? Here’s some helpful questions and answers from our very own skincare expert, Joelle Greene, RN. Which skin type can benefit from this product? All skin types will benefit from using Vitamin K Serum, even those with sensitive skin. What type of Vitamin K is in this product? Vitamin K Serum contains Phytonadione, the most beneficial form of topical Vitamin K.
Can I use this product as a moisturizer for my face? Yes. Vitamin K Serum is great as a lightweight, facial moisturizer. However, it does not provide protection from the sun. We recommend using it with Multi-Protection Broad-Spectrum SPF 50, or Intellishade®– which is available at RVC Skincare. If you are looking to try Revision Skincare’s Vitamin K Serum or are interested in the entire Revision Skincare line, visit Reno Vein Clinic and ask for Joelle! Ask the skincare expert: Is eye cream necessary? With so may face lotions and potions out there, we were curious if an eye cream is a “LOVE IT” or “LEAVE IT” item. We asked our own skincare expert, Joelle Greene, RN. to give us the scoop! It’s important to note that the skin area around your eyes in the thinnest and most sensitive on you entire body. Many eye creams are formulated specifically to be gentler for this area… and include ingredients that are beneficial for concerns like dark circles, firming and puffiness. If those are issues that you are looking to address specifically, then a dedicated eye cream is a wonderful addition to your skincare routine. Before you start using a new eye cream, you should dab a little bit on a test spot for a few days, then watch out for tearing, redness, rashes and even blisters that some products cause on such sensitive skin. Once you find one that works, you’ve got to use it every day in order to see the results you hope for. It’s also important to use an SPF 30 eye cream every morning, because skin cancer is really common in the eye area. You can also try using your current moisturizer and sunscreen around your eyes. If you experience no irritation doing this, you can keep with that technique as well. Got Pain in your veins? Pain in the veins can result from a variety of causes, ranging from mild to severe. Commonly, vein pain in the legs occurs due to poor circulation, varicose veins, or cellulitis, a common bacterial skin disease. Vein pain in other parts of the body can be related to the outside temperature or muscle strain. In severe cases, vein pain can result from thrombophlebitis (vein swelling due to a blood clot) or a thromboembolism (a potentially life-threatening blood inflammation and clot in the veins). Are you at risk of developing blood clots? Do you have any other symptoms, such as enlarged or visible veins? How long has your pain persisted? When did you first notice your vein pain? Where do you feel your vein pain? For more information about vein pain, contact Reno Vein Clinic 775-329-3100. So, what’s a toner used for? Toning is an essential step that ensures skin is properly prepared for the remainder of your skincare routine. It’s designed for specific skin types and conditions, these solutions eliminate stubborn dirt, oil and dead skin cells left behind after cleansing and balance the pH of the skin. Most importantly, toners create an optimal environment that promotes the absorption of subsequent skincare products. We love the SkinCeuticals Equalizing toner because it’s formulated for all skin types. This alcohol-free toner helps balance, refresh, and restore the skin’s protective pH mantle while removing residue. The Hydroxy acids gently exfoliate dead skin cells while the botanical extracts such as witch hazel, rosemary, aloe and chamomile soften, soother and tone the skin. The SkinCeuticals Equalizing toner is fragrance and odor free and retails for $34.00. If you are interested in this toner or other SkinCeuticals products, call or visit Reno Vein Clinic (775) 329-3100 for more information!